Vintage bedspreads of all styles and types are coveted by collectors and homeowners alike. These pieces of woven nostalgia are beautifully crafted, highly decorative, and have the tendency to last for generations within a family. We often get inquires about how to care for antique Bates spreads that have been passed down -- so many, in fact, that we wrote up a short article about How to Care for Your Bates Blankets & Bedspreads. Many of our styles, though manufactured today, honor the traditional patterns and weave structures of our history. Our Terry (or Hobnail) Bedspreads, construction is perhaps one of the oldest. The most famous design by far is Martha Washington's Choice Bedspread. If you've ever had interest in vintage textiles, you may be familiar with the term "chenille." Chenille bedspreads have been around since the early 20th century, but reached the height of their popularity in the 1950's. Today, vintage chenille spreads are often restored and sold in online stores like Ebay and Etsy. Although some people use the terms "chenille" and "hobnail" interchangeably, they differ slightly in appearance. Chenilles and hobnails are an evolution of candlewicking, an old embroidery technique used by the American colonists. Traditional candlewick designs were created using the yarn for candlewicks (who would have guessed?) This thick, cotton thread was stitched onto bedcovers in a decorative fashion. In the hobnail (or terry) weave, large loops of heavy yarn are raised to form the design. The same principle applies to chenille spreads, except the loops are clipped, giving the bedspread a fuzzy, "caterpillar" look. Sometimes, you will still see the name "candlewick" used to describe a hobnail or terry bedspread. Part of the fun in owning a vintage bedspread is knowing the rich history behind it. These treasured heirlooms not only contain memories and family stories, but chronicle fascinating evolutions of specified craft. 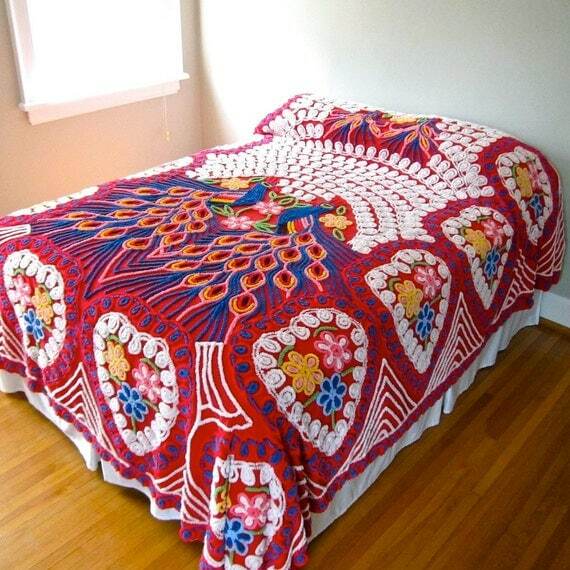 Do you have a Bates bedspread that has been handed down? Please share in the comments below! I am looking for a pattern discontinued by the Vermont Country Store about 8 years ago. New old stock or used in good condition would be fine. I saw it on the beds at the Blue Swallow Motel on Route 66 in Tucumcari NM. In that context, it was naturally called the Blue Swallow pattern, but it may also be known as Bluebird. There is one large bird in the center and a smaller one near the pillow area. A floral border surrounds the birds, and a double wavy pattern farther out. I have seen similar patterns with the bird’s breast having a different color but, to be exact, the birds would be all blue. Nice collection of bedspreads… do you also happen to have "seconds’? Do you have one that would fit a queen size in white. How much do receive for them? Yes..I do have one that I have had for about 20 years. Still looks good and has been washed several times. It is light pink, king size with a flower in the center. love your stuff, but do you have cal. king sized spreads? thanks!